How would you feel knowing you were able to quit your 9-5 and travel the world while expanding your side-hustle into your full time passion and legacy for a small small investment in your growth? Over the past four years, I've gone through an incredible shift in my life. I went from working for a non-profit eeking out $2k a month, to starting my own personal growth business and generating a quarter-million dollars. What I really love is that my work is a reflection of my personal growth and as I continue to grow, expand and serve more, I also continue to expand; how much I receive, how much I love, how much freedom I experience, and how much I embody my truth. What I know is this - we cannot afford to keep our medicine, gifts, and wisdom to ourselves anymore. In this time of Great Awakening on the planet, we need the healers and artists to step forward and offer their medicine. In this age we have all of the tools to spread our message, yet most healers and creatives don't recognize the potency of their gifts or see how they can use them for good while also being financially nourished. Whether your art is healing, speaking, singing, creating, dancing, or thought-leadership - the world needs you and your art more than ever. Allow your dream the chance of living by enlisting my loving support, guidance, and psychically-enhanced strategic insight in this richly potent, fun, and intimate online workshop. Trust in yourself and your dream. You are reading this for a reason. TOTAL VALUE: Equals $3,888USD total. This package is normally included in my VIP One-on-One Two Day Retreat for $3997usd but you get all of this for $497USD. 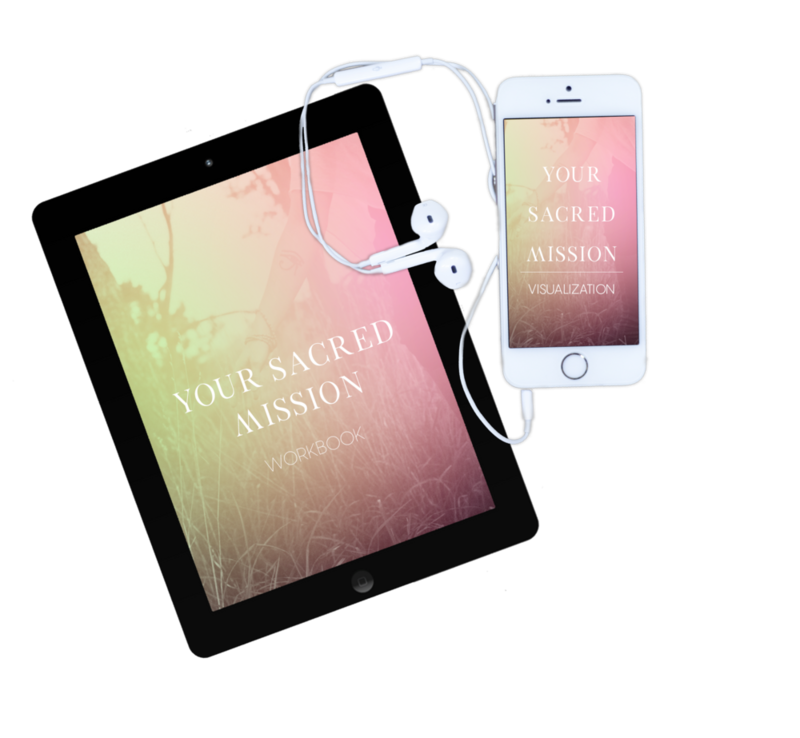 This 3 part Audio & Ritual Workbook Journey will support you before we begin our workshop together. You'll be guided to get clarity on your desired experiences, dreams, and outcomes for the year and Embody them energetically, Align your words and actions, and open your energy to begin receiving. • 3 Ritual Workbooks which will prompt deeper discovery, clarity and alignment with what you deeply desire. A great primer to our workshop. WHAT IF THIS TWO DAYS COULD CHANGE YOUR LIFE? Over the past four years of rocking my soulful life's work, I've learnt countless lessons, endured lots of mistakes, and experienced exponential growth in my heart, soul, and career. I've invested tens of thousands of dollars into my growth, held events for hundred of people (in gorgeous locales), made major business mistakes that cost me hundreds of thousands, made hundreds of thousands, and been featured on national TV, radio, and other media. I've experienced the elevation of major exposure and made major PR mistakes that attracted lots of criticism. It is from the experience of staying grounded within it all of that that I desire to support you in the growth you are ready to experience - and share some of the knowledge I've experienced so that you can carry forward in your mission with pleasure. Investment for this two-day online workshop is $997usd total or two payments of $597usd. Installment plan is only available if registering at least two weeks before listed workshop dates works. All payments must be completed before attending workshop. This will be the last year I'll be offering this workshop at these rates, so take this divine sign that this is your opportunity! Once you register, you'll be directed to a page a Welcome Page where you reserve your Spot for Your Preferred Day. You'll also be prompted to fill out an initial questionaire with your contact info. 7 Days before the workshop, you'll receive Your Workshop Guidebook to work on before the LIVE Workshop along with Call In Details. While you don't have to have them finished, the more you have clarified, the more feedback you can gain. WHEN ARE THE COMMUNITY CALLS? These weekly LIVE Community Calls + Trainings will be at the following times (please note, replays will be available within 24 hours). Once your register, please fill in the questionnaire you'll be directed to. You'll receive an email confirmation of registration immediately and seven days before the workshop you'll receive your Workshop Guide. Complete as much as possible. For the workshop itself, make sure you're in a quiet and private space and have your laptop open, a journal, beverage and snacks. You'll also want to have headphones to minimize distortion and a strong wifi signal. Bedhead or not, we wanna see your face;) Come prepared to laugh, cry, and learn a lot about yourself and your work! Sometimes life happens; whether that's someone losing a job, a loved one dying, or a new transition (like birthing a baby!). However, having worked with hundreds of people over the past few years in these journeys, I've also seen people decide to 'quit' just before their major realization, transformation, or breakthrough. This work can break us down so we can breakthrough. I've also seen people go through major challenges and still stick with 'the work' to emerge even more alive. confident and strong in themselves. We are creating an all-out, no holds-barred environment....no wishy-washy, half-in/half-out energy. In that, if you're not 100% satisfied after the workshop and can provide proof of completed assignments given, you will be 100% refunded. If there is an additional reason such as a death in the family or other something else, you can cancel your registration with 14 days notice by email to: info@phoenixmuranetz.com -or- reschedule your workshop. By registering to this workshop, you fully agree to these terms and conditions.